A slim flexible tube with a light on the end (bronchscope) is passed through your nose, through your larynx (voice box) and allows the doctor to look directly at your trachea (windpipe), bronchi (branches of the airways) and into some areas of your lungs and allows samples (biopsies) to be taken. The doctor watches the view on the TV monitor. 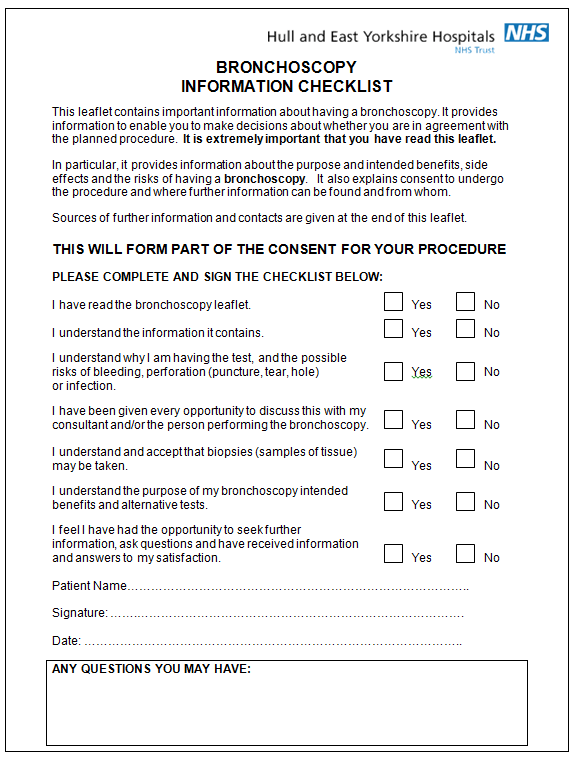 Why do I need a Bronchoscopy? You have probably been troubled by some symptoms, which have led to your doctor advising a Bronchoscopy. It is important that you do not have anything to eat or drink for 6 hours before your test. Warfarin – These are blood thinning tablets and usually have to be stopped for a period of time before your test, please contact your Endoscopy Department for advice. Creutzfeldt-Jakob disease/variant Creutzfeldt-Jakob disease (CJD) – Commonly known as mad cow disease – Please inform the department if you have been notified that you are at risk of CJD/vCJD for public health reasons. Clopidogrel (Plavix) – Please inform the department if you are taking these tablets as these may need to be stopped prior to your procedure. If you take any of the following blood thinning tablets please contact the Endoscopy Department before your appointment for further advice: Apixaban, Rivaroxaban, Dabigatran, Argatroban, or Edoxaban. What happens to me in the Endoscopy Department? Our friendly reception staff will greet you on arrival. They will let a nurse know that you have arrived. Occasionally there may be a delay in your appointment time due to an emergency taking place. If there are any delays you will be notified as soon as possible and be kept informed. A nurse will collect you from the waiting room and explain what will happen next. You will be given an approximate time of when you may be collected to go home. It is advisable to leave any valuables at home. We will ask you questions about your general health and work through the health questionnaire you have completed for us. Please feel free to ask questions. The endoscopist will meet you and explain the test to you. You will both sign a consent form. This is to show that you understand what will happen and agree to the procedure being performed. If you have any queries or worries, please tell us. We will check your blood pressure, pulse, and oxygen levels, before your test. If you wear glasses or dentures, you will be asked to remove them. You will be taken to the examination room where you will be given a local anaesthetic throat spray. If you are having sedation, the needle will be placed in the back of your hand or arm. You will be made comfortable on a bed in an upright position. A fine plastic tube will rest by your nostrils to give you some extra oxygen. A probe will be placed on your finger to monitor your oxygen levels and pulse rate. If you are having sedation it will be given at this time and you will feel sleepy. Yes. People have sedation to keep them comfortable while the doctor carries out the test. Sedation is given through a needle in the back of your hand or arm. It makes you feel sleepy and relaxed but does not put you to sleep. You can still respond to what is happening. Yes. This is very important. The sedation given can have effects, which last some 24 hours after the test. You can become forgetful and also sleepy again. Your test may be cancelled if you do not arrange to have someone to collect you and stay with you for the next 24 hours. Do not sign any important and/or legal documents. As the tube is passed down your throat more anaesthetic is passed down the bronchoscope to numb your voice box. This may make you cough but will not interfere with your breathing. It usually takes 15 20 minutes to examine all areas fully. It is very common for small samples of tissue (biopsies) to be taken for analysis in the laboratory. They are removed painlessly with a tiny pair of forceps. You will be settled and relaxed. Most people cannot remember having the test done. You can help by listening to the instructions your nurse gives you. By staying calm and relaxed, the test goes quickly and easily. Try to control your breathing by taking slow deep breaths. This helps to stop the feeling that you want to cough. What happens when the test is finished? If you have had sedation, you will need to rest on a trolley in the recovery room for approximately 30 minutes. After 1 hour you will be helped to a chair and given a cold drink. Your relative or friend will then be contacted to collect you. It is quite likely that the back of your throat will feel sore for the rest of the day. Complications after a bronchoscopy are rare but can include a reaction to the drugs given for sedation, bleeding or pneumothorax (collapse of the lung). Common problems, which are not serious, include a slight nosebleed, sore throat, and streaks of blood in your phlegm. Some people, for reasons we still do not fully understand, are particularly sensitive to this drug. The breathing can be too shallow and too slow. In these cases we stop the examination, give more oxygen and if required we can give an antidote, which reverses the effect of the sedation. This is usually all that is needed and the person recovers with no ill or lasting effects. If you would like more information, please ask your nurse or endoscopist. The Recovery nurse will explain your test and if we have taken any samples to you and (if you wish) to your carer. There will be a written discharge form with any instructions that you need to follow. Your hospital doctor or GP will receive a copy of the results. Results from a biopsy may take up to 21 days to reach your doctor. You will have an appointment with your consultant to get any further results. If you require further information about your test, your GP, consultant, and the Endoscopy Department is a valuable source of information. Department of Health (2001), Guide to Consent for Examination or Treatment. Department of Health (2001), Consent – What you have a right to expect. These are free of charge. For additional general information, you can visit the Department of Health section on the GOV.UK website. They also provide documents specifically regarding consent. 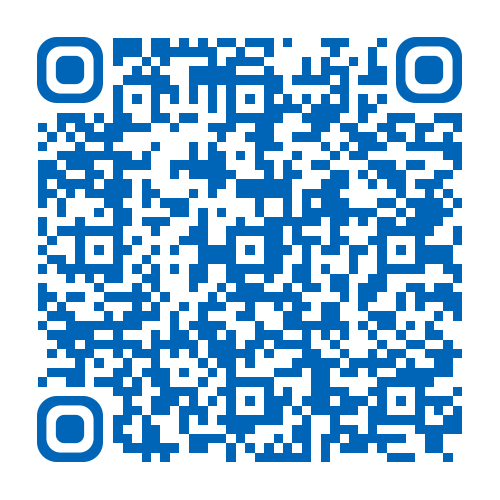 The Endoscopy Department, Castle Hill Hospital (01482) 622069. (Direct line) Monday – Friday, 8.00am – 5.00pm. The Endoscopy Department, Hull Royal Infirmary (01482) 674790 Monday – Friday, 8.00am – 5.00pm. Ward 100, Hull Royal Infirmary Out of hours telephone: (01482) 674860. What do the words in the leaflet mean? Consent: This is the agreement between you and the endoscopist. You are agreeing to have investigations or treatment and that you understand the purpose, benefits, alternatives and risks. You and the endoscopist during this process sign a consent form. Endoscope: A tube for looking inside the body. Consultants of the Department of Gastroenterology. Consultants of the Surgical Department. Staff of the Endoscopy Department. Patients attending the Endoscopy Department.